Calling a house cat domesticated is comical at best. We may not think about our cats’ predatory instincts while they’re napping in cardboard boxes or sitting on our chests while we marathon our favorite TV shows, but the truth is that felines aren’t that far removed genetically from their wild relatives, so they retain many of their hunting instincts. Your fierce little feline’s adorable displays of affection — you know, the dead birds and the gutted lizards left on the porch with your morning newspaper — are actually problematic for the proverbial circle of life. House cats kill somewhere between 1.3 billion and 4 billion birds in the U.S. every year, according to the Audubon Society. The issue is so prominent and concerning that many organizations have created programs warning about the dangers of outdoor cats, such as Ohio State University’s Indoor Pet Initiative and the Cat Indoors program through the American Bird Conservancy. Adventure cats are, in our humble opinion, some of the best and brightest companions to have by your side as you trek across the world. Surfing? Hiking? Camping? Sailing? The sky is the limit for our favorite feline friends, and we wouldn’t have it any other way. Sometimes, though, things can go wrong for even the most responsible cat owners. While we believe our kitties can absolutely join us in the great outdoors, keeping the small wildlife and birds safe should be a primary concern, so read on for tips on how you can do just that. 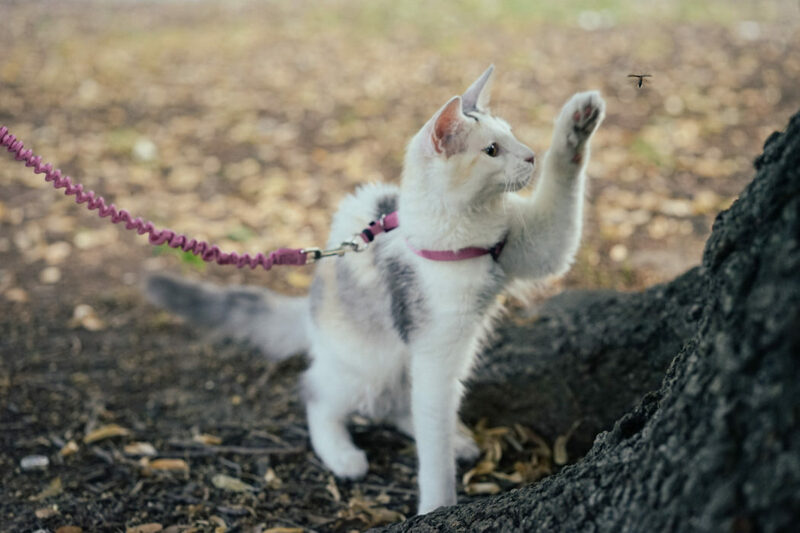 Responsible cat owners have long let their pets roam the backyard without a leash, but accidents do happen, so we recommend always keeping your cat on a leash when he’s outside — for his safety and for the safety of wildlife. In addition to a leash, there are some other surprisingly easy ways to help keep the local little critters safe. 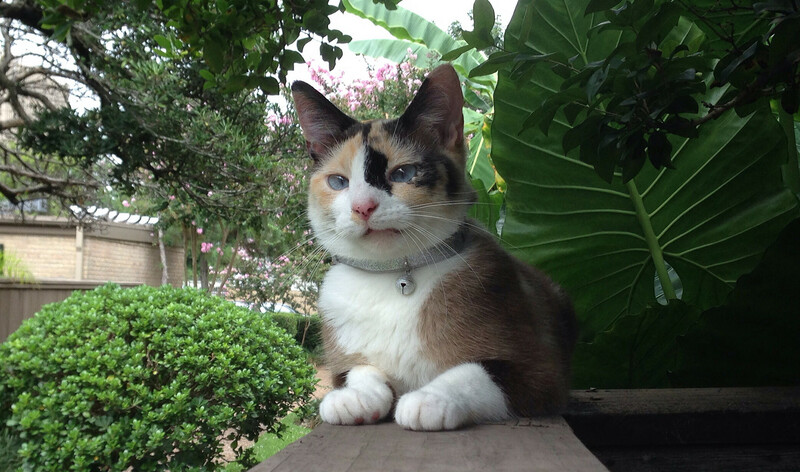 Keep birdbaths and feeders away from shrubbery where a cat could easily hide to attack. Cats can’t climb metal poles, so installing feeders or birdhouses atop these (instead of dangling them from a branch) can also make a big difference. Tree wraps made of hard-to-grip metal, aluminum foil or plastic can create the same effect. Tree baffles are cones made of wire or metal to wrap around the base of trees, and they’re effective when positioned 4 feet to 5 feet above the ground. You can also consider building a catio, so your kitty can enjoy some fresh air and sunshine while the rest of nature stays safe. When adventuring, be sure your cat companion is wearing an appropriate harness and leash, preventing them from wandering off too far and causing damage when you least expect it. Keep them contained overnight when camping to ensure they can’t slip out of your tent or hammock to leave with you a dearly departed gift in the morning. If you’re in an area laden with small animals, be sure to keep a close eye on your cat, or consider carrying them until the danger — and the lure of the hunt — has passed. 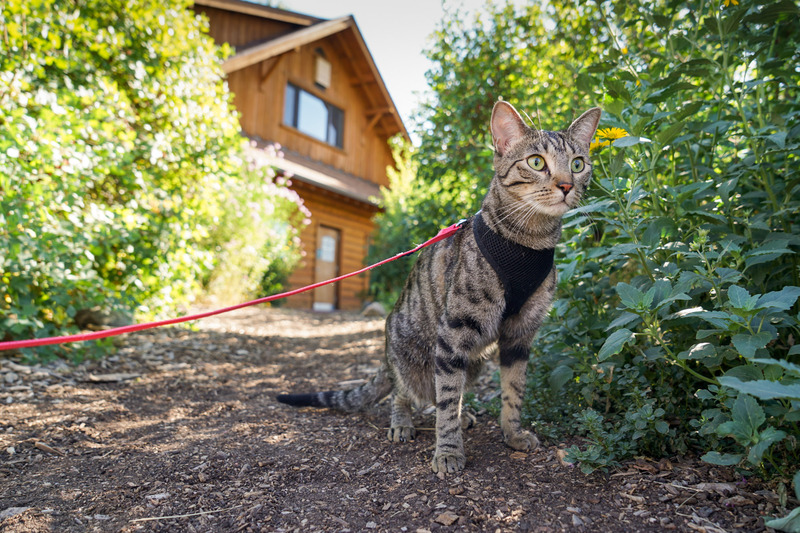 Whether you’re adventuring or simply lounging in the yard, another easy way to keep your cat from pouncing on birds, moles and other creatures lies in a variety of attachments made for cat collars. This can be something as simple as attaching a bell to your cat’s collar, or it may be more involved, such as the items outlined below. Birdsbesafe Collars are large and bright and are intended to allow birds to see a cat before it’s too late. They fit over your cat’s collar, and they come in vivid colors that are prominent outside and easily visible, even in low light. Your kitty will look meownificent in one of three colors and pattern designs for $9.99 USD. CatBibs prevent cats from being able to pounce properly, and they even tout some scientific backing. Murdoch University’s Biological Sciences Department ran an independent field trial and found that CatBibs stopped 81 percent of cats from catching all types of birds and 45 percent from catching small mammals. The bib also comes with reflective logo designs, making your purrfect companion visible at night to not only nocturnals, but also humans. The bibs attach to cat collars and can be purchased for $9 USD. Looking for safe ways to indulge your kitty’s hunting instincts? Check out our article on indoor adventures and learn how playtime is all about the hunt.